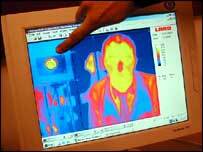 It knows your face, your body temperature, your behaviour and can strip you bare without removing your clothes. And the next generation of surveillance technology is coming to an airport near you. Millions of pounds of additional investment have been ploughed into airport security since the 11 September terror attacks. In the UK an extra £30m a year is being spent on improving surveillance at the major airports. Yet the recent case of Nathaniel Heatwole reminds us that things are still far from perfect. Heatwole, a student, systematically breached airport security at two US airports to stow an array of threatening weapons such as box cutters and bleach aboard two passenger jets. All too often the security glitch is human. Which is why, increasingly, airport authorities are turning to electronic surveillance. Technological strides have resulted in some big advances in surveillance in recent years. Some of the latest devices are being exhibited this week at a conference dedicated to airport security. Just as luggage is systematically "X-rayed" to see what's inside, so passengers may be in the future. 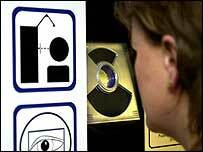 So-called millimetre-wave scanners, which produce an image similar to X-ray, look through clothes to detect concealed weapons. Unlike metal detectors, these can reveal ceramic knives as well as some plastics. They also forewarn guards what to expect when someone is pulled over for a further search, says Ben White, of the government-run defence firm Qinetiq. Faster than traditional X-ray machines, they produce a moving 360° image. One drawback, though, is privacy - the machines can reveal rather too much of what's underneath one's clothes. "It's still in development," says Mr White. "There are solutions we are looking at, such as modesty filters that apply a sort of fig-leaf to the image." The problem with running scores of CCTV cameras in an airport terminal is someone has to keep a beady eye on the images they produce. To get around that, new devices are appearing that automatically detect "strange" behaviour. To do this, they learn basic elements of normal human behaviour in a situation, such as people wandering though a terminal building. If someone starts running or jumping over barriers, the system flags up this "anomalous" behaviour. Its reliability is hard to asses - what, after all, qualifies as "strange" behaviour? - but it cuts down the element of human chance, says Emma Brassington, of the British firm Roke Manor Research. Biometrics is the buzzword of the moment. It means using the unique features of each human body to identify them. The trick is to get computers to do the recognising. Iris scanning, highlighted in the movie Minority Report, is already in use at Amsterdam's Schipol airport. Fingerprint recognition has also been tested, but proved easy to defeat. 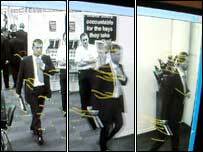 Another option is facial scanning, where computers seek to match up a face caught on camera with one of several thousand suspects in the data bank. In the past its reliability has been questionable, but Paul Crombie, of the technology firm Novar, says it is improving all the time. The company has had a kit on trial in Dubai airport. "Our system measures the distance between the eyes and the mouth and then generates 1,700 other points on the face before scanning a database of up to 100,000 images and finding a match - all in one second," says Mr Crombie. "It won't be thrown by beards, hats or make-up either. And it doesn't see skin colour - so a suntan can't fool it." Reliability, he says, is good, although he concedes the technology is still in its infancy. One story that knocked war and terror attacks off the front pages earlier this year was Sars - the potentially deadly virus that swept through Hong Kong and struck fear into millions of air passengers. Within a few weeks of the initial panic, the UK firm Land Instruments sold about 50 of its thermal imaging systems to airports in the Asia and Middle East. The equipment, which includes a finely tuned infra-red camera, was used to quickly scan passengers and identify any with even the slightest hint of a fever. The Sars threat has abated, but the cameras are still in use, says Gary Chamberlain, of Land Instruments. "It's a virus and could mutate and return at some point." This technology could be used in future to pinpoint possible terrorists, who might be sweating before boarding. But Mr Chamberlain admits passengers can be nervous for a number of reasons and there are ethical issues to consider. The claims are long on fantasy, short on figures. The technologies mentioned are notoriously unreliable. You won't see the results of real tests, because the companies pushing these systems are too embarrassed to show them. Biometric technology is not very good. It does not yet support all the hype. The Tampa (Florida) police force have just given up using their trial biometric recognition system because it did not work. It was supposed to find known offenders in the streets, it did not find any. It either did not pick any matches, or if the match parameters were tightened up, it picked everyone and their dog! Ethical issues must take second place to security. I would happily be "stripped bare" by a scanner if it meant I could feel safer when boarding a plane. The safety of the many is more important than the modesty of the few. I can't wait to see how the "unusual behaviour" detection software deals with over- excited children. I have been involved with a couple of projects attempting to use biometrics for user identification for computers. The problem is that, even if you can get the technology to work, there are generally simple, physical ways to defeat these systems. Surely if some sort of modesty filter is used on the X-ray scanning machine, then that would be the best place to hide something? Having been a frequent flyer in the past, I have a lively appreciation of security issues. The idea that odd movement can be quantified in such a way as to permit machine identification of it is absurd. That won't work. The 360° scanner idea is not bad, although someone has to guarantee the honesty of those using it to me. 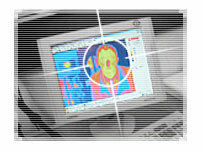 Biometrics, ID Cards, X-Ray Specs etc. A gross invasion of civil liberties without a doubt.